Once bitten absolutely not twice shy, the band of FIREWIND drummer Michael Ehré (also GAMMA RAY, METALIUM etc. 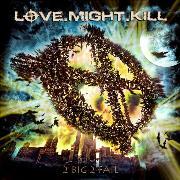 ), LOVE.MIGH.KILL, returns with their second effort in two years. Their debut “Brace for Impact” came highly recommended by yours truly, can they top that? One half-hearted intro of more length than usual later this album moves into high gear. I actually think they have topped their debut. Songs like the refrain blessed “XTC”, the EUROPE and DIO reminiscent “The One” the melodic hit of a title track, the lively “We Fall”, the faultless “Big Screen Pleasure (and Pain)” or the ending of the likewise impeccable “Alone” and groovy DIO variety “The Perfect Mistake” tells you to buy this album! The b-side of this album, actually only one, is called “The Great Escape” and might have been a song they could have done without. Not that it is a filler, it´s simply that to be really an addition to this disc, all songs must be of almost infernal quality. LOVE.MIGHT.KILL dares to lean back towards the happy go lucky eighties, deliver almost radio-friendly refrains all over and, in some cases, worship old heroes that have passed on or moved on into new territories, as I dare say is the case of both DIO (R.I.P.) and EUROPE. The overall sound by Michael himself and well-known studio wizard Markus Teske is crisp and warm. Nuff said…this one goes to the top ten of 2012!